My name is Jaiwantie Manni and I am the current FAO Schwarz Fellow at the Museum of the City of New York. My direct service work involves working with students and teachers who visit the Museum on field trips. For my special project at the Museum, I incorporate science, technology, engineering, and math (STEM) activities into our field trips, and plan and implement our Family and Community Engagement Programs. I also have the pleasure of working with, and learning from, Joanna Steinberg, who was one of the first Fellows funded by the Foundation. Joanna completed her fellowship at the Museum in 2008, but has continued to be an integral team member of the Frederick A.O. Schwarz Education Center at MCNY in her role as Senior Education Manager. Joanna chose to work at the Museum not only because she had previous experience here but also because she wanted to work in a dynamic museum in a large city. Having grown up in New York City, she was particularly interested in urban and local history, and working with students from across the boroughs. As a Fellow, Joanna’s direct service duties included leading fields trips—The Grid: Urban Planning in NYC and Life in New Amsterdam, which I also teach—and work on developing programs that aligned with the NYC Department of Education’s curriculum. The notion of having a direct service focus as well as a special long-term project, which the Fellow focuses on for the two-year period, is a concept that has been incorporated into the fellowship since it was established in 2006. One of her special projects was coordinating an educational program at the Museum called New York City History Day. 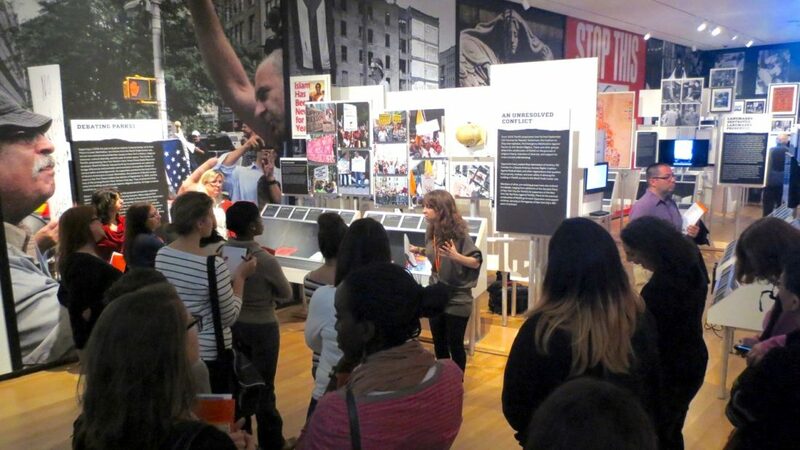 This annual citywide event brings together hundreds of students from across NYC to share their research in the form of exhibitions, documentaries, performances, papers, and websites. Joanna expanded participation in the program by over 100 participants and developed relationships with many schools who were new to the program. To help new schools prepare, Joanna led workshops with teachers and student groups about how to research and interpret primary sources and develop thesis statements to make a historical argument. As a former history major, Joanna was excited that the program creates a community of young historians in the making, and recognizes and ignites their interest in history. It’s been wonderful to see the program grow under Stephanie Dueno, also a former FAO. Schwarz Fellow, who served as the coordinator after Joanna until 2017. She created extensive curriculum that teaches students how to conduct historical research and develop their own perspectives, in addition to strengthened partnerships with the Department of Education and schools across the city. Like myself, Joanna had previous experience working in museums. Joanna was a history major and an art minor at Oberlin College in Cleveland, Ohio. During her time at Oberlin, Joanna completed a Museum practicum at the Allen Art Museum, which is where she led tours as a Museum Educator and worked as the Assistant Registrar in Collections. 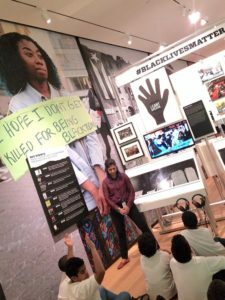 During one summer, she worked at the Museum of the City of New York in the Urban Peer Docent Program mentoring high school youth who learned to teach in museum exhibitions for the first time. However, being a Museum Educator isn’t something you learn overnight. Joanna mentioned that it takes time and practice to hone your pedagogical skills, which involves fine-tuning questions to elicit lively discussions, learning to listen closely to students and having them respond to each other, while also building on their comments and observations to enhance their engagement with the exhibitions and discussions about New York. For Joanna, the Museum has provided an amazing laboratory for developing interactive learning strategies, thinking about accessibility and how students interact in the spaces, and identifying optimal moments for learning. Even though I’ve worked in two museums before coming to MCNY, I find myself also seeking advice on how to fine tune these skills and learning how to make connections between students. It’s been amazing to see the Museum transform over the years to look at the vast history of the city in New York at Its Core and approach social justice as a central focus of New York’s ongoing history in exhibitions. Years later, Joanna has developed many lesson plans for Activist New York and recently worked with a team of educators to develop lesson plans for Beyond Suffrage: A Century of New York Women in Politics for teachers to use in their classrooms. She has also worked on developing some of the components of the Future City Lab field trip that I am working on. 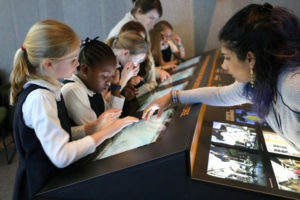 The Future City Labis one of the Museum’s new permanent galleries that’s part of New York at Its Core, which allows visitors to examine the city’s current challenges and develop strategies to respond to these challenges using interactive digital games. Today, Joanna is my go-to person for anything regarding field trips. She helps teach me the field trip content and is someone I seek feedback from while developing a STEM-based educational experience for students visiting the Future City Lab for my special project work. Throughout these past six months, I have worked with students from grades K–12, and have learned to lead five different field trips. Using STEM concepts, I have also developed a new interactive display for theFuture City Lab to help students learn about the strategies New Yorkers are using to address major challenges that the city is facing in terms of the environment, housing, and transportation. My hope is that the inclusion of tactile objects, like concrete and materials from green roofs will help them understand the inner workings of the city and the choices professionals and community members are making to solve problems. Having the opportunity to look at photographs and touch urban materials will not only resonate with students, but will draw a real connection between the exhibition and the city beyond the Museum’s walls. I’ve worked with Joanna and other members of the Schwarz Education Center to make decisions about what to include in this display so that the concepts featured in the exhibition are more accessible to our students of all ages. Having Joanna’s expertise on how students grasp information has been extremely helpful and has made my project more meaningful. It’s great to be a part of the full circle of the fellowship at MCNY and it’s also inspiring to see what upcoming endeavors the future holds. It has been delightful to come into the Museum and work with Joanna to develop a more STEM-based educational experience for students visiting the Future City Lab. Every day, I get to work in a professional setting where everyone is each other’s cheerleader and everyone is given room for professional growth. I not only get to collaborate with other Museum Educators but also our Andrew W. Mellon Foundation Pre-Doctoral Fellows who are trained as Museum Educators to utilize their doctoral research in a public history setting by engaging the Schwarz Education Center’s audiences. This summer, I will be working with some of the Museum interns who are young adults being trained in Museum Education techniques as a first-time job opportunity. They lead field trips to camp groups and Family Programs in July and August. I am looking forward to being a part of their training and supervisory team where I can impart my recent knowledge as a new staff member to this new cohort of interns. With the support of the FAO Schwarz Family Foundation, the Frederick A.O. Schwarz Education Center at the Museum of the City of New York offers career development opportunities to a wide range of professionals at different levels of their career. I feel fortunate to be the beneficiary of one of these opportunities. From the Foundation’s resources to my colleagues at MCNY, I’m learning how to hone my creativity, experience, and knowledge to contribute to the important educational programs offered by the Museum.